Completed and inaugurated at the beginning of 1998, the Cilicia Museum was the last building to rise on the premises of the Catholicosate at Antelias, the tenth location of this institution as of early fourth century. It stands as a living testimony of the historic millennial journey of the Catholicosate. A museum that would sustain the history of the Catholicosate at Sis in particular, and revive some of its past glory was a dream cherished by all the catholicoi of the Great House of Cilicia. The project was finally launched in 1994, during the incumbency of Catholicos Karekin II Sarkissian, (co-adjutor to Khoren I: 1977-1983, catholicos 1983-1995, Catholicos of All Armenians at Ēĵmiacin in 1995). It was rigorously continued by his successor, Catholicos Aram I Keshishian (1995-) and was completed at the end of 1997. The official opening took place on March 30, 1998. The last massive structure on the premises, it also houses the library of the Catholicosate. 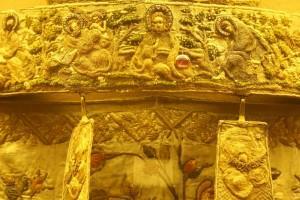 Most of the precious relics and samples of religious arts are the rescued treasures of the Catholicosate. In the summer of 1915 they made an Odyssean journey from Sis to Aleppo, and in 1930 they were brought to Antelias, the new premises of the Holy Se of Cilicia. In addition to these treasures, and through donations and purchases the Museum now has very significant collections. The Museum is on three floors, on the first of which the collections of liturgical metalwork and related artifacts are on display. 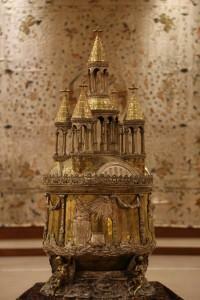 The relics and reliquaries are an important part of this collection. One of the highlights is the Right Hand (aĵ) reliquary of St. Gregory the Illuminator (Surb Grigor Lusaworič‘), which is traditionally under the direct guardianship of the incumbent catholicos, and not on display. This relic is an essential element in the anointing ceremony of the catholicoi of the Great House of Cilicia. The ot her silver reliquaries that contain the hand relics of St. Nicholas (restored by Catholicos Kostandin IV in 1325), St. Sełpestros/Sylvester (restored in 1772), and St. Bar Sauma are on display on this floor. These and other relics are kept in finely carved ornate silver cases shaped as crosses, ostensories (čačanč‘), spears, and churches. Before leaving Sis by orders of evacuation from the Turkish government, the monks of the Monastery of Sis had the good sense of packing the silver chandeliers and the candle holders that stood on either side of the altar of the mother cathedral, most parts of the great chandelier of the central nave (made in 1804), two smaller silver chandeliers, and the silk curtain of the altar of Holy Trinity in the cathedral. These and other religious artifacts conjure up the image of the luxurious interior of the cathedral (renovated by Catholicos Kirakos I Mecn (the Great, 1797-1822). The Museum has a unique collection of bibles with silver bindings, altar and other liturgical artifacts some of which are ornate with precious stones. There are gold and silver plated and carved candle-holders, pigeon-shaped silver vessels for the holy oil, incense burners, chalices, and last but not least the cauldron of the Holy Chrism (muṙoni kat‘say). These artifacts are very rare samples of the superior craftsmanship of their makers at Cilicia and elsewhere in the Armenian Provinces of the Ottoman Empire and Constantinople. The highlight of the silver bindings is the famous Bible of Barjrberd, copied, illuminated at Hṙomkla in 1248, and bound by finely carved silver plates in 1254. It is one of the most superior examples of the art of the goldsmiths at Cilicia. The illuminations on high quality parchment are the work of the painter Kirakos, known as the “fabulous”, who was the master-teacher of T‘oros Ṙoslin,the most famous painter of the thirteenth century. Another major example of these arts is the silver binding of the Mayr Maštoc‘ copied and illuminated at Sis at the beginning of the fourteenth century. The binding is as fine as the artistry of the icons. On the upper part of the cover the anointing of a catholicos and the coronation of a king are depicted, and on the lower part the ordination of a bishop and the blessing of the Holy Chrism. Also, a cauldron of the Holy Chrism appears on the cover of this manuscript, but this is a different vessel than the one made in 1817 for the Holy Throne of the Catholicosate at Sis, and still in use at Antelias. The top part of the latter carries five domes and the vessel itself is very elaborately carved. This was a gift to the Holy Throne of Sis by Grigor and Sargis Duzean Č‘elebis, and their associate Yarut‘iwn Pēzčean (Harutiun Bezjian) of Constantinople. Also on display on the first floor is a significant collection of 73 European antique pocket watches, the oldest is dated 1580, and the most recent 1910. Most are by famous makers such as Bautte à Genève (1825), Julien Le Roy (1790), J.W. Benson (1873), Modernista (1900), etc. The Museum has a large collection of liturgical vestments with fine silver and gold embroidery. Many of them date back to the seventeenth century and a clear connection may be discerned between some of these embroideries and the miniatures of the period. The great altar curtain at the Church of the Holy Virgin at Bursa (made in 1733), which depicts the Last Judgment, is an example to this effect. The vestments of the collection are generally made by silk, velvet and embroidered by fine threads of gold and/or other materials. Many pieces, such as mitres (xoyr) and other accessories, are decorated by figures, portraits and floral designs on crimson, brown, and green velvet. A mitre in particular attracts attention for the Holy Nativity scene embroidered against an arabesque background on one of its sides. It was made in 1802 for Catholicos Kirakos the Great, and later on it was worn by Catholicos Sahag II. The collection of staffs and asas (cane in Arabic) is on the first floor too. There is a blue silk liturgical cape (šurĵaṙ) with floral embroidery donated by Y. Bezjian. It was worn by all the catholicoi of Cilicia as of 1804, when it was presented to Catholicos Kirakos the Great. 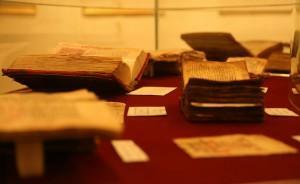 About forty manuscripts are on display on the second floor, where the collection of old printed books is too. As mentioned, the Bible of Barjrberd and the Mayr Maštoc‘ are the rarest and most unique manuscripts. The collection received many additions and it now has about 200 manuscripts. Complete works or sections on display present the evolution of the Armenian art of manuscripts and illuminations as of the ninth and tenth centuries. About a third of the manuscripts are illuminated and testify to the high standards of this art. The oldest illuminated manuscripts were produced at the major Cilician monasteries, such as Mecayr and Skewṙa. The collection has a New Testament (dated 1293), which in addition to typically Armenian motifs, also has motifs in western style. These seem to be later additions by a painter, who had western training in Italy in the fourteenth century. Bibles that come from the Armenian mainland indicate to the existence of workshops in many cities such as Erznka and other locations on the Island of Ałt‘amar, and the monasteries of Sanahin and Bĵni. The art of manuscripts continued after the fall of the Kingdom in Cilicia, and many samples up to the seventeenth century stand as proofs. Native traditions in these arts were maintained in the workshops of Constantinople, Sivas/Sebastia, New Julfa, Bulgaria and elsewhere. A collection of 45 illuminations, that are mostly reproductions of important works, is also displayed on this floor. They were made by renown artists, such as V. Surēneanc‘, E. T‘adewosean, and H. M. Arcat‘panean. On the occasion of an art exhibition at Antelias in 1948, Catholicos Garegin I Yovsēp‘eanc‘ (incumbency 1943-1952), a great scholar and patron of Armenian arts and culture, took the initiative to prepare this collection. He wished to expose the public to these medieval artworks in manuscripts kept at the National Matenadaran in Erevan, the Armenian Patriarchate at Jerusalem, the Mxit‘arist Library at St. Lazar, Venice, and the Mother Cathedral of Surb P‘rkič‘at New Julfa. As part of the manuscript collection, the Museum has a small collection of six Armenian prayer scrolls known as hmayils and/or pahpanaks. Faith in the power of the written word against evil and protection by the sacred word are common aspects in Near Eastern peoples of all backgrounds and faiths. There are also sorcerers’ magical scrolls sometimes known as “curses” (aneck‘). 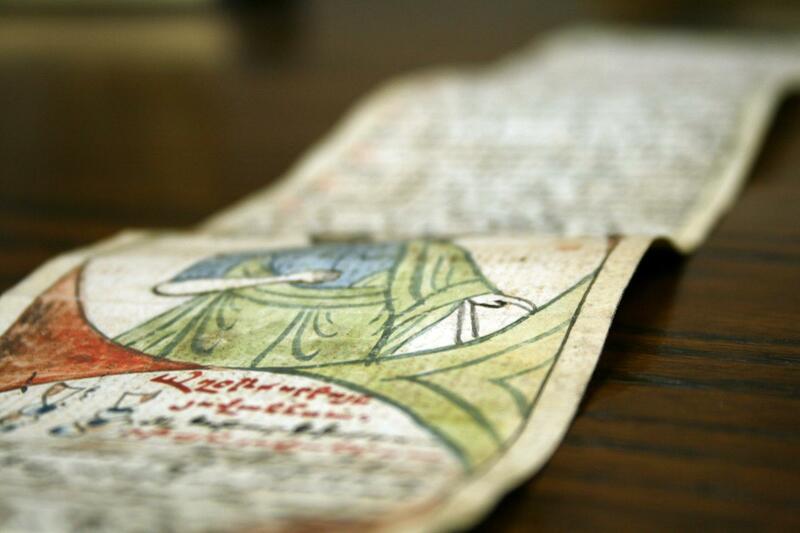 The hmayils were initially made of parchment, then paper of all qualities replaced it. These scrolls are essentially 5-9cms wide, and 5-8 meters long sectional stripes. In time, new pieces are added to the main body. The hmayils are kept in specially made leather cases, or are rolled and fastened by strings or ribbons attached at the end. They are often ornate with motifs of Armenian miniatures, sometimes images of Christ, the Holy Virgin and saints. It is believed that the Armenian prayer hmayils were created in order to replace the sorcerers’ “paper”s (as they are called in Arabic, Turkish and in some west Armenian dialects) made for all sorts of objectives — often not religious and/or well-meaning. In the prayer hmayils the texts are invariably excerpts from the Gospels, special prayers for certain ailments or issues (such as infertility, travel), lives of saints and martyrs, and spiritual songs (šarakan) of the Church.The texts are often written in local dialects and idioms, mixed with classical Armenian (grabar) phrases, predictably full of grammatical and spelling errors, even in the case of excerpts from the Bible. Most hmayils carry colophons about the dates, scribes, makers, owners, personal matters, aims and motives. However, some are difficult to identify because of missing little sectionals at the beginnings and ends. Even though the hmayils may have appeared during the eleventh and twelfth centuries, the oldest known sample is from 1428, preserved at the National Matenadaran in Erevan. As of the early seventeenth century, the hmayils were created mostly in Constantinople/Istanbul, Tigranakert/Diyarbekir, Caesarea, Cilicia and Axalc‘xa (in Georgia). There are few samples in several European Museums. These are on display in the hall of the manuscripts. Armenian printing began in Europe in 1511, then in Constantinople and replaced copying of texts. However, the tradition of copying manuscripts continued along printing to the end of the seventeenth century. During the sixteenth and seventeenth centuries, the early printers played pivotal roles in paving the way before scholarship during subsequent periods and in particular the Awakening (Veracnund) in the eighteenth and nineteenth centuries. The collection has samples of books printed in the early printing presses at Venice, Amsterdam, Marseille and elsewhere. There are two copies of books printed by Yakob Mełapart (Hagop Meghabard) in Venice. They are the Parztumar (Barzdumar, 1512) and Tałaran (Dagharan, 1513). These samples may be compared to the first printing of the Bible in Armenian (Astwacašunč‘) in Amsterdam by Oskan in 1666. A clear development can be traced in Armenian printing, which reached a very high standard in the Interpretation of Grigor Narekac‘i (Meknut‘iwn Grigor Narekac‘woy), printed in Constantinople in 1745. This book is considered a masterpiece of the art of printing at the time. To the eighteenth century it was still customary to illuminate books. During the seventeenth century Armenian illustrators also borrowed western ornamental motifs for Armenian bibles. 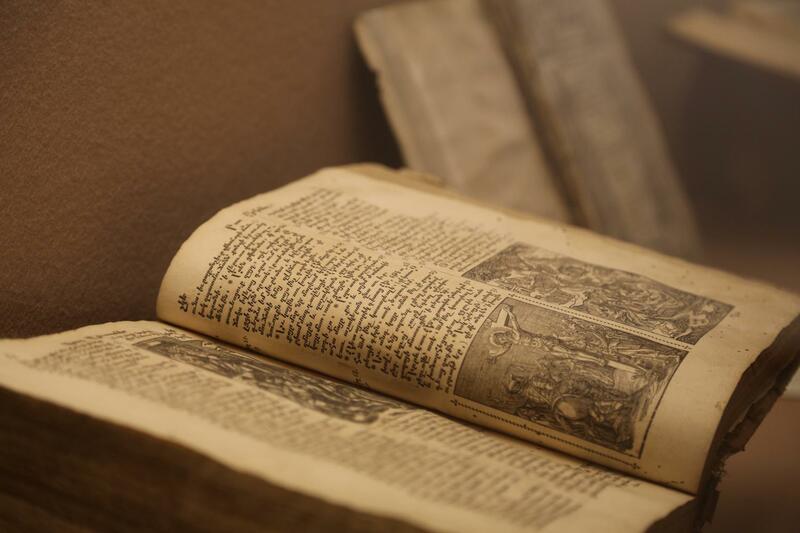 There are two copies of the Bible of Oskan, where prints by wood-block carvings, made by Dutch artist Christoffel Van Sichem Son (1546-1624), are used. Armenians have a rich and varied numismatic tradition extending from ancient times. The collection includes over a thousand examples of coins and banknotes from all periods, as well as many coins of neighboring lands. The earliest Armenian coins were struck by the kings of Sophene and Commagene (circa 260 BC-34 BC) situated in western Armenia. The most commonly known ancient Armenian coins, however, were struck during the Artaxiad (or Artašēsian) dynasty (189 BC – 6 AD). The collection has numerous Artaxiad (Artašēsian) bronze coins, notably those belonging to Tigranes II the Great (or Tigran Mec) 95-56 BC). Tigranes created an empire that stretched from the Caucasus Mountains to the Mediterranean coast of present day Syria and Lebanon, and left a formidable numismatic legacy. During the Middle Ages, coins with legends in Armenian characters were struck in greater Armenia and particularly Armenian Cilicia. The Museum is well endowed with a representative collection of Cilician silver and copper coins struck by the barons and kings. More than one hundred different coin types have been classified, and virtually no two Cilician coins, even those struck from the same pair of dies, are identical in every respect. The script is Armenian and they all carry Christian iconography. Every coin depicts the cross of Jesus Christ on one or both faces and many also mention God (the word Astucoy or variations thereof) in the legend. The strategic location of Cilicia and its ports provided the merchants with excellent facilities for conducting vigorous trade with the East. Coinage was part of political as well as economic status and developments and the coins reflect circumstances.King Lewon I (1198-1219) struck large numbers of coins with Armenian legends and overtly Christian iconography. The silver dram (or tram, borrowed from Arabic dirham), measuring about 21 mm in diameter and weighing about 2.9 grams of 93% silver, was the engine of Armenia’s economy. It became an internationally accepted currency and supported vigorous commercial activity that characterized and sustained the Kingdom. The largest silver coin attributed to King Lewon I is the silver double dram. There are abbreviated legends along the edge of the coin that read clockwise Lewon T‘agawor Hayoc‘ (Lewon King of All Armenians) on the obverse, and Karołut‘ambn Astucoy (by the empowerment of God). The political implication of the term “All Armenians” is not clear. There are luxurious coins of Queen Zapēl and King Het‘um (1226 to 1269), King Smbat (1296-1298), Kostandin I (1298-1299), Ošin (1308-1320), Lewon IV (1320-1342). 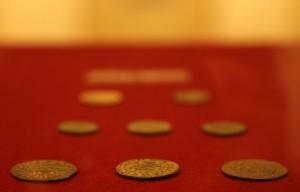 The last coins however reflected the decline of the kingdom. Paper currency was not used by Armenians until the late nineteenth century, when Armenian churches in the Ottoman Empire issued paper or thin cardboard tokens about the size of postage stamps for use as small change. Official government paper currency notes (but no coins) were issued and circulated for the first time during the independent Republic of Armenia (1918-1920), and then in the Soviet Socialist Republic of Armenia (1921-1924). The Cilicia Museum includes examples of the artistic paper currency dated 1919, issued by the first Republic of Armenia, designed by the noted painter Aršak Fet‘vačean (Arsghag Fetvajian). Some archeological pieces are also on display on the second floor. They come from two private collections. Ancient Armenian civilization and arts are represented in the first collection. It includes human and animal figurines from the Neolithic Age. 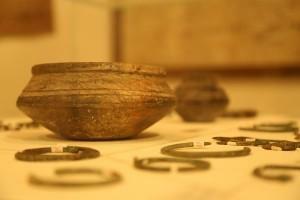 From the Bronze Age, there are bracelets, earrings, buckles, nails and axes. Urartian civilization is in turn represented by bronze arrows, bracelets, armbands, and a large clay pot from the ninth century BC decorated by geometric and animal motifs. The second collection seems to represent the entire Lebanese coast from the Stone Age to the Byzantine period. Among many artifacts, there is also a beautiful and intact Phoenician blue glass cup. A section of the second floor is dedicated to the display of the collections of carpets and tapestry from the eighteenth century to the twentieth. 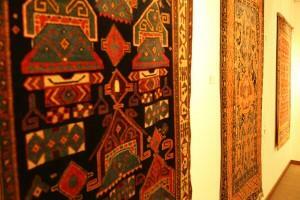 The Museum has around fifty antique carpets, nine of which are of thematic nature. There are five prayer rugs, six Karabagh rugs, the rest are classified as Iranian and Turkish, and are probably the works of Armenian weavers. The thematic rugs may indirectly be classified under the major categories of Armenian carpets, as they have motifs of horses, saints, emblems, cross-shapes, chandeliers, liturgical objects and chapels/churches. Most have dates and Armenian inscriptions. The collection has two valuable and relatively small carpets with the theme of the Holy Virgin and Child, they are made at different periods and locations. Also, samples of clothing, embroidery and household objects are on exhibit here. In the same hall hangs a map of Armenia, hand-drawn by ink on canvas, made in Tabriz in 1926 by Martiros Xeranean, a native of Van. 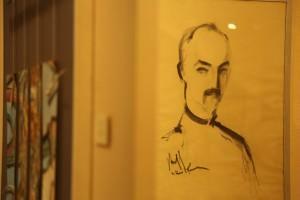 The painting and sculpture collections are on the third floor. 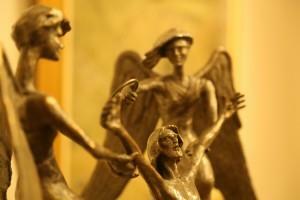 Major works are on display from a total of about 350 paintings, and 20 sculptural pieces. Some works decorate the catholicosal premises and the Seminary at Antelias and Bikfaya. Few xač‘k‘ars or cross-stones too were donated to the Museum. These are traditional memorial and funerary slabs of cross-shaped carvings typical of Armenian arts. Two of these xač‘k‘ars are from the seventeenth and eighteenth centuries, a third one is believed to have been carved in the twelfth century as a tombstone/memorial of Prince Vasil Pahlawuni, the elder brother of catholicoi Grigor III (1113-1166) and his brother Nersēs IV Šnorhali (1166-1173). Among all the collections at the Museum, the painting collection is unique in several respects. Unlike the rest of the museum’s artifacts, such as metalwork, manuscripts,liturgical vestments, textiles, and carpets, the paintings and sculptures are mostly post-Genocide works by artists, who were born in the various countries of the Middle East and Europe. Primarily as a post-Genocide phenomenon, the collection stands as a witness to the special circumstances and experiences of Armenians in exile. Furthermore, the arts of painting and sculpture developed in the new locations of exile and migration following the massacres of late nineteenth century then the early twentieth and the Great Genocide of 1915. In other words, these arts originated in strictly diasporic conditions and in reaction to them. The visitor to the Cilicia Museum gets a rare chance to see a truly diasporic collection of works by first, second and third generation artists, to mention a few, Guv, Guvder, Guiragossian, Assadour, Noriguian, Torossian and others. About a dozen works by artists from much earlier periods and other locations, such as Ayvazovski, and Makhokhian and Western Europe and the Middle East such as Jansem, Carzou, Sarukhan, and Chahine give the collection a wider aspect and significance. There are few works by painters such as A. Hunanean and Y. Yakobean from Armenia, as well as a good number of works by amateur artists and some children. * Part of this text is based on the brochure of the Cilicia Museum by Sylvia Agemian, Kilikia T‘angaran (Antelias Beirut: Catholicosate Publications, 1998). The material is mostly extracted from The Armenian Catholicosate of Cilicia – History, Treasures, Mission, Ed. Seta B. Dadoyan (Antelias Beirut: Catholicosate Publications, 2014).